I didn’t ask for games. I didn’t ask for photos. I asked for a streaming media solution that could do things right: Something easy to pick up, simple to use, and something that actually made the experience of playing and navigating through multimedia, dare I say it, fun. Amazon promised all of the above with Fire TV, which the company unveiled Wednesday at an event in New York City. Unfortunately, the device doesn’t live up to its own hype. Perhaps Amazon’s homegrown solution was a bit premature and its ambitions too lofty, because while Fire TV can do almost everything, little of it is done right. At the Fire TV unveiling, Amazon officials sounded like they perfectly understood how frustrating TV streaming devices are for their owners. Amazon focused on three main problems: Search is hard, especially for anything not on a bestseller list; streaming devices often provide slow or laggy performance; and TV set-top boxes tend to be closed ecosystems. Fire TV is a pretty good solution for the latter two problems. It’s pretty snappy, especially when you’re waking it from sleep or scrubbing along a movie or TV show, and the relatively open ecosystem will allow for more apps and games to hit the Fire TV in due time. But speed and openness mean very little when the glue that holds everything together—search—is an utter mess. At Wednesday’s event, Amazon kept emphasizing the word “simplicity.” With Voice Search on Fire TV, you don’t need to use a directional pad to find the titles you’re looking for, and can start watching right away. That’s how Amazon advertised its Voice Search in Fire TV, but that’s not how the feature works in practice. Let me give you an example. After downloading a number of apps (Netflix, Hulu+, Showtime, etc.) and signing into my various accounts, I thought I’d give Fire TV’s Voice Search a try by searching for something I knew was currently free and available to watch on Netflix. I pressed the microphone button on my Fire TV remote and said “The Avengers,” and in seconds, The Avengers popped up as the top result—except Amazon only provided ways to watch the movie through Amazon, not other apps like Netflix. 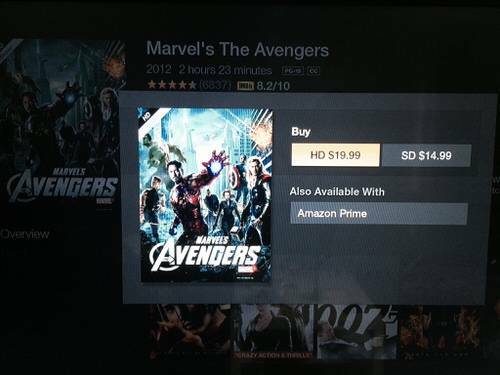 When you search “The Avengers,” or any movie on Fire TV, Amazon provides you with two main options. You can watch it for free with Amazon Prime, buy the film for $20, or rent it for $5. There’s a button on the right that says “More Ways To Watch,” which would seem like the ideal place to advertise a movie’s availability across other applications like Netflix or Hulu+, but when you click on it, it shows you the same options as before: Buy the movie or rent it through Amazon, or watch it on Amazon Prime for free. Fire TV isn’t smart enough to know when movies or TV shows could be watched for free on other platforms—you still need to visit those individual applications. But wait, it gets worse. If you try using Voice Search within any Fire TV apps like Netflix, Amazon will immediately take you out of the app and provide you with options to purchase the content through Amazon—Amazon’s Voice Search won’t work within any apps. What year is this, Amazon? If I’m searching for a title, why are my options to subscribe to Amazon Prime, or spend $20 on a movie? That’s still more than the cost of a movie ticket… as if the Fire TV’s $99 price tag wasn’t enough. If the rise of online piracy over the last decade has taught us anything, it’s that more and more people are willing to circumvent paying unreasonable prices for content that’s freely available online—even if the legality is still a bit murky. Just look at how many people downloaded the Breaking Bad finale, or entire seasons of Game of Thrones just to avoid paying for HBO, which charges $15-20 a month depending on your service provider. 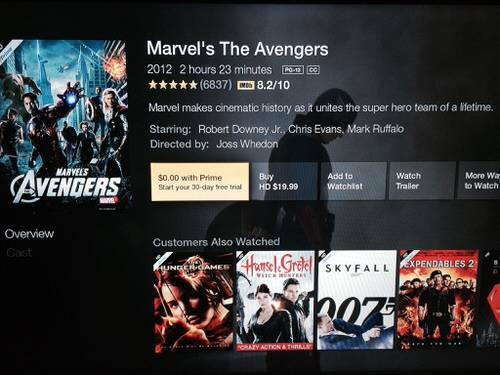 For that money, you could buy The Avengers through Amazon! If Amazon won’t change its pricing structure to match this day and age, the least it could do is point me in the direction of the free content on its set-top box. 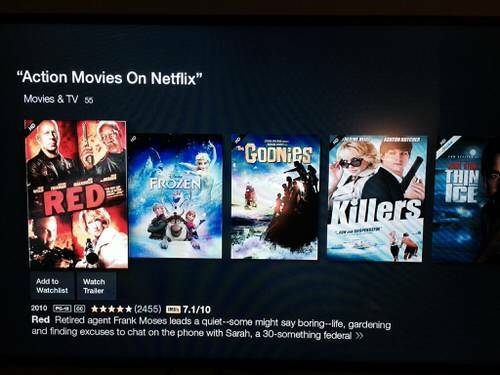 Thought I'd try a workaround with Voice Search, but these movies aren't actually on Netflix. Due to the extreme limitations of Voice Search, browsing through Netflix—where you’ll probably spend most of your time, considering Amazon’s rather limited library of quality movies for free streaming—is, once again, manual labor. In time, applications like Netflix and Hulu+ could support Voice Search—maybe even through a simple software update. But since searching is so important on this device, Amazon has really hung early-adopters out to dry. Even when Voice Search works, it can’t filter the results by movies or programs you can stream for free. So even if you ask Fire TV to give you “Action Movies,” you’ll have to inspect each result to see if it’s free, $5, $15, or $20. (Spoiler alert: It’s almost never free.) In other words, search is still a major hassle, and far from Amazon’s original promise of “simplicity” on Fire TV. Even if you own a Google Chromecast or Apple TV, you still might be tempted to pick up a Fire TV simply because it’s the first major streaming device designed to handle gaming. 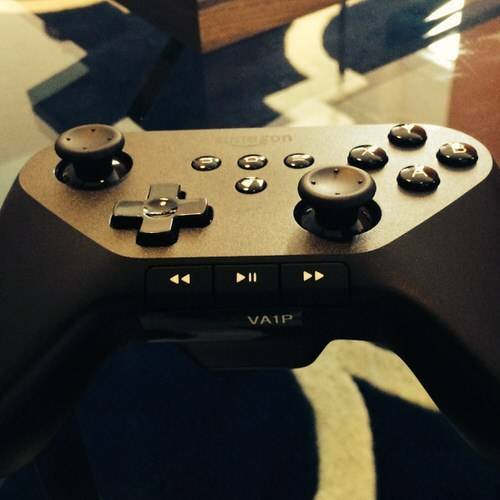 Amazon even offers a dedicated game controller for the Fire TV for $40. That game controller is comfortable enough, especially for anyone who’s ever picked up its Xbox doppelganger, but Fire TV games can also be played with the remote control. Fire TV can even support multiplayer gaming for up to five players, but only one player can actually play on the screen at a time, using either the Fire TV remote or dedicated game controller. 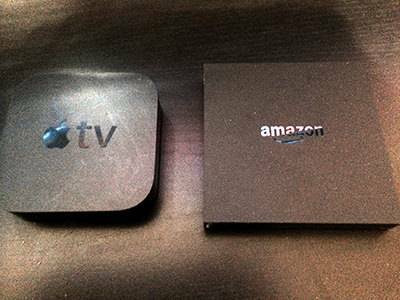 Split-screen isn’t an option for multiplayer-supported Fire TV games, so the other four potential gamers would have to join and play via their smartphones or (Kindle Fire) tablets, which connect to Fire TV over Wi-Fi. Here’s the thing—the technology may be there for playing games on Fire TV, but I’m skeptical about whether or not there’s a demand out there for this particular kind of gaming. I love video games, but if I’m going to throw down any money on a game—whether it’s 99 cents for an iPhone game or $59.99 for a console game—I want to be sure I’m going to play it. Still, I treat mobile and console games differently. Cheap mobile games are minimal investments, and Fire TV games are essentially mobile games, certainly so far as price is concerned. And generally, I want to play mobile games in short spurts—maybe for five or 10 minutes—and then do something else. Sitting down with a PlayStation game, on the other hand, forces me to stop doing everything else, since those games tend to be more complex and therefore require plenty of attention. In time, Fire TV games could grow to be as complex as console titles, but as Amazon Games VP Mike Frazzini told me after Wednesday’s event, Fire TV wasn’t designed to compete with console games. If that’s the case, and Fire TV games never approach the quality of console games, it might go the way of the Ouya—another interesting concept that people ultimately chose not to use. Amazon advertised Fire TV as an open ecosystem, but to be frank, it’s only ideal for Amazon Prime and/or Kindle owners. It won’t be enough to convert Apple TV owners, myself included—at least for now. Fire TV is fast, there’s no doubt about that. My favorite part of Fire TV is when it boots up, because it’s almost instantaneous. Other set-top devices can’t wake up from sleep this quickly. Amazon also advertises Fire TV’s “predictive streaming” technology, which is said to reduce booting and buffering significantly, but I haven’t yet noticed a major difference between this device and my Apple TV when it came to booting up movies and shows. In fairness to Amazon, the company admitted this feature dynamically improves over time through one’s individual use, and I have not yet owned this device for a full week. I get it, it’s fast. Speed aside, however, search is still a major issue, and so is the general availability of shows, music and movies. I’m not just talking about HBO Go here; I’m talking about how Fire connects to non-mobile devices. Many people still purchase their media—movies, TV, music and games—and store it on their computers, not their mobile devices. For me, my MacBook is still my main multimedia hub, not my phone or tablet. The fact that I can’t beam movies from my computer to my Fire TV is pretty disappointing. Amazon says Fire TV is “open,” but if it couldn’t support beaming from one’s computer, it missed another huge opportunity to serve consumers by including a USB port, which would’ve given Fire TV owners the ability to play video or music files through its set-top. Sure, I could register with a service like Plex, load all of my media onto that app and stream those films to my TV over my local network; I could also send my laundry to New Zealand instead of using the washing machine in my basement. Plus, if I wanted to use Plex, I might as well buy a Chromecast for one-third the price. These feel like omissions to me, and they make me want to unplug my Fire TV for good. Given time, I believe Amazon can still fix many of these compatibility issues and programming deficiencies with software updates and more developers and companies signing on to build products for Fire TV. I believe Amazon has the right idea for Fire TV, despite its poor execution, so I’ll be interested to see how Fire TV is tweaked in the coming weeks and months. For now, though, the problems for such a relatively pricey device might be insurmountable for many consumers. For the same price, you might as well buy an Apple TV right now, or, better yet, wait until Apple releases its major update to the Apple TV within the next few months. Apple just announced that its annual Worldwide Developer Conference will take place in June, and there are lots of indications that Apple will use that opportunity to announce its fourth-generation TV product.  That’s the difference here. Fire TV might become an excellent offering in time, but Apple is still three generations ahead, and ready to take the next step. And then there’s Google’s competitively-priced, über-popular Chromecast and its army of similarly-cheap clones. Unless Amazon acts quickly by adding new content and updating its software to fix its search issues, Fire TV might become obsolete sooner than we think. At least the screensavers on the Fire TV are good.